First Line: I should have expected the letter. Strong, independent women don't always have a lot of close friends; therefore, spending so much time with fellow mid-century modern designer Jane Strong during the past six months has been heaven for Madison Night. Jane and Madison had put in a lot of work on a collaborative design for an upcoming prestigious competition but when Jane abruptly ends their friendship, Madison decides to go solo. When Madison personally turns in her entry, she discovers Jane dying in the public restroom, and it takes police very little time to put her at the top of the suspect list. However, Jane's death almost takes a backseat in Madison's mind. Her computer is among several that have been hacked, making Jane's death seem targeted instead of random. With the competition deadline looming, Madison must partner with a very unlikely ally to prevent everything coming to a crashing halt. 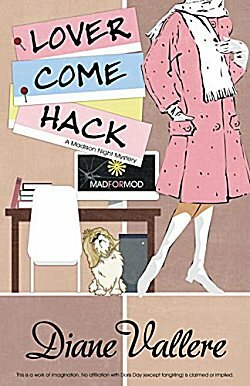 Diane Vallere's Doris Day-inspired Madison Night cozy series keeps going strong with this sixth entry, Lover Come Hack. Vallere provides good insights into the emotions and thought processes of her fifty-year-old main character, and I had to laugh at the result of Madison telling the other two sides of her romantic triangle to leave her alone for six months: It's been "the most productive six months of my life." Once again, the author provides an intriguing mystery laced with computer viruses and excellent misdirection. One thing that I was very happy to discover (and others may not) was the fact that there was a bit more emphasis on interior design in this book. After all, it is one of the reasons why I like this series so much. Another reason to enjoy Lover Come Hack is that it seriously channels Doris Day, even more than previous series books. Vallere has probably caused an upsurge in readers viewing this remarkable actress/singer's movies-- by both the curious and by those who do remember her. While Madison is the main draw in this series, I have to say that I am enjoying the evolution of another character-- another strong, independent businesswoman-- everyone calls "Nasty," and it is this evolution that really makes me look forward to the next book. Bring it on! This sounds like fun, Cathy. I'm so glad you include cosies here as well as other sorts of crime fiction. I like the reminder that there are a lot of good ones there, and I don't read enough of them. I think this was my Thrill of the Year series last year. I didn't expect to enjoy it so much, but I do. If you're a big Doris Day fan, you should love it, Kay.